Thanks to Chili for this comic which feels like me all over. 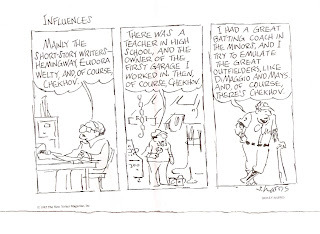 I mean, it's got baseball and Chekhov, what could be better? I'm trying out a new feature on Blogger with this post. Apparently you can schedule posts to post while you're away. That's pretty neat, eh? It will be if it works anyway. If you're seeing this it did. I'm heading north for Joe's funeral mass, I'll be back late on Monday night. I hope that you all have a wonderful weekend. Please feel free to leave me a comment telling me what you'll be up to. Kizz; that comic came from a book called, well, damm I can't find it, but it was a compilation of New Yorker cartoons. She laughed when she saw it for the first time and immediately mentioned you. I photocopied it for her then - TWO years ago - and when I found it, tucked in a bag, I sent it home with Beanie. I am glad you liked it!!! I'm so sorry to hear about Joe.